"I love your new Hair bow gift sets. I received one for my baby shower, and was more then pleased. 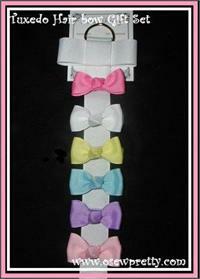 Choose from several sizes and colors to make up this hair bow gift set. 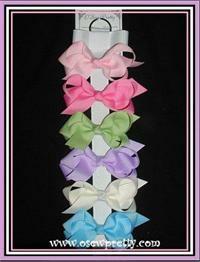 This assortment makes a great Shower Gift, comming home gift or select the bow colors for your own little blessing. Create your own gift set by choosing 6 different colors. 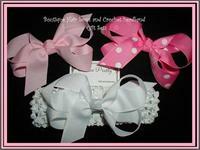 Gift set includes hair bow holder and a change a bow white lace headwrap. Create your own gift set by choosing your hair bow size and 6 hair bows in matching colors to make cute sets for pig tails or pick different colors and use them to keep hair out of your little one's face. Personalized and pink, how cute is that! This pink assortment makes a great Shower Gift, coming home gift or for your own little blessing. Create your own personalized gift set by choosing from three different bow sizes and countless color's with the child's first Initial. Make's the perfect welcome home,first birthday or baby shower gift. 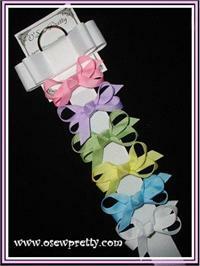 A 2' hair bow holder is also included.